I worked on a bunch of products for my backyard﻿ last week. One of the best deals would have to be this daybed. It was actually our first couch (we had two), when we first got married. We bought them from West Elm online before a store opened in our area. We were under construction at the time, so they stayed in the boxes for a few months. My in-laws came over the day we were ready to set them up and what a laugh we got. We opened up the boxes, built them, and had to laugh. They were twelve inches off the ground. My mother-in-law sat with her feet curled up and commented, oh, they are cozy. Ummm, I think she was being nice. We lasted with them for maybe 2-3 years. About 6 months ago, I found this at a garage sale for $5.00. 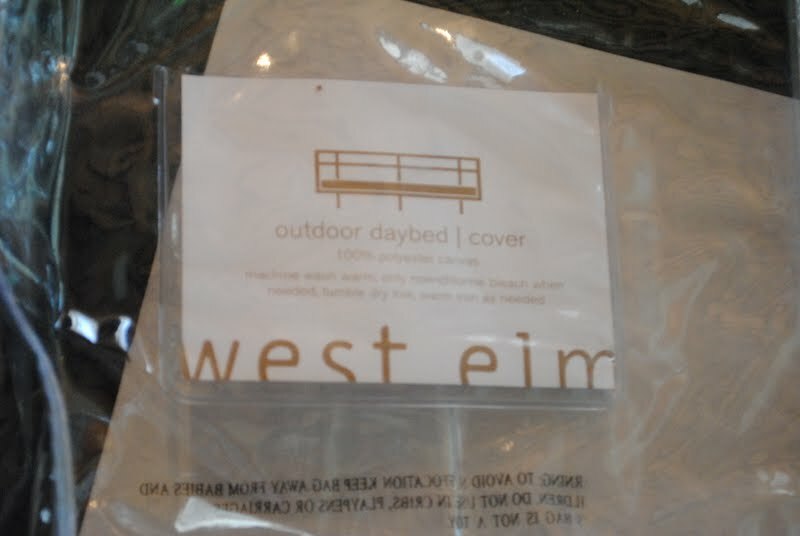 An outdoor daybed cover. I had done nothing with it, because I thought it was thinner than our mattress and I couldn't figure out what do with the mattress from not getting soaked through. 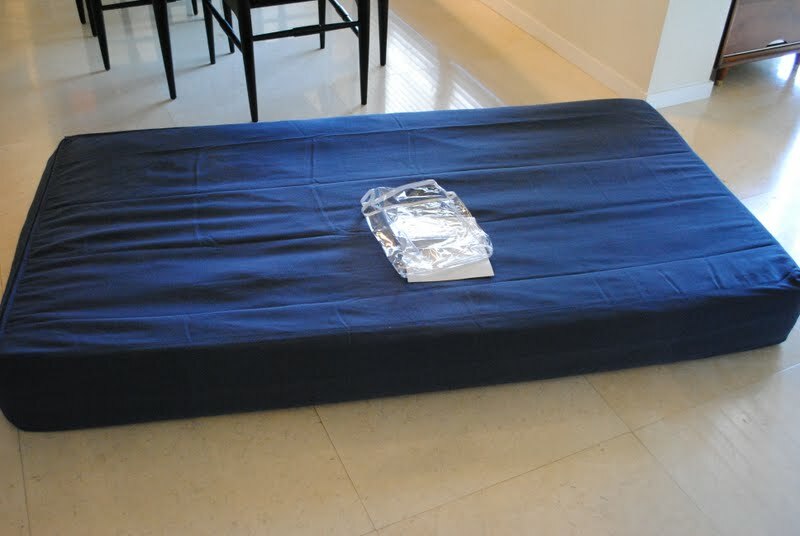 Here is the original mattress that came with the sofa. The best part, white cloth. I don't know what we were thinking. They have two back pieces that match as well. Here is the cushion. These cushions had been hiding out in the shed and not being used. 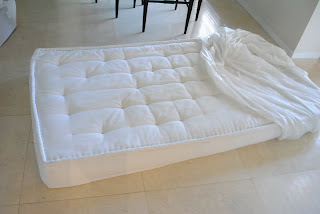 I found a zippered vinyl mattress cover at Bed, Bath, and Beyond. This is the frame of the sofa. It had been toppled over in the yard for a couple of years. The wood slats had actually rotted. My awesome father-in-law used some wood he had and made me a new platform. Here it is. I added some pillows. (Pardon the dusty front, I dragged this out of the house myself). HOoray!!! What a great piece to have for lounging in the backyard and sipping lemonades! Lovely as always! xox! When can I come over and sit on it? It looks SOO relaxing! Love! Love this! 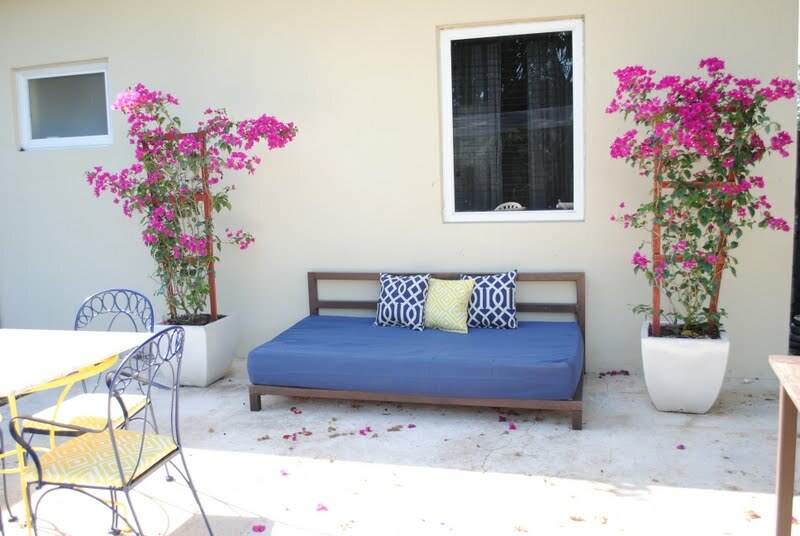 I'v always wanted a daybed on the back porch to lounge on and read a book. Glad you didn't haul it off. I love the daybed concept and how you have used it in your backyard. Perfect for a lounge-like, relaxed feel. I love this idea! I've wanted one of these since I first saw them on a beach in Mexico. I'm glad you didn't have Salvation Army pick it up either! Looks great!! I love it when things work out like that! Looks great- perfect for reading a book and relaxing outside! I have those same pillows! This is great! 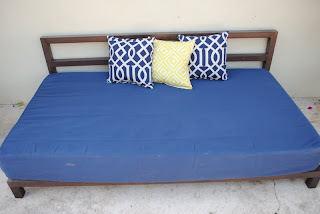 We've been talking about building a daybed for the deck ever since we lounged in one on vacation in Jamaica. (your bougainvillia reminds me of that!) Eager to know how it holds up and how it works out with any rain. I want an outdoor day bed too. I just have to make a platform. 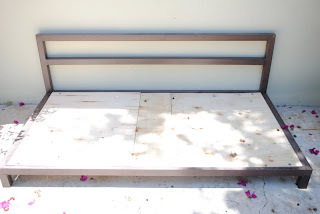 When I get new mattresses for my daughters bed (that she desparetly needs,I'm going to move one of them outside and keep the other one under the trundle. I love the idea of lounging under the tree. I had already thought of using a plastic cover for the bed. We used to have one but it was thrown out after my daughter was potty trained. Thanks for sharing.